If you live in the Titusville, FL, area and have yet to stop into our pizza restaurant, then we strongly encourage you to set down your phone, computer, tablet, or get up from the couch to enjoy some of our freshly made and delicious pizza. In today’s blog, we’ll be going over the many different pizza options that we offer at Kelsey’s Pizza. As a locally owned and operated business, we strive to offer anyone who loves pizza some tasty options. While we have specialty pizzas, you can always order your personal favorite such as a pepperoni one or all cheese. Whatever you love on pizza, we’re happy to make it for you! If you’d like to stop in or order online, then we can help! 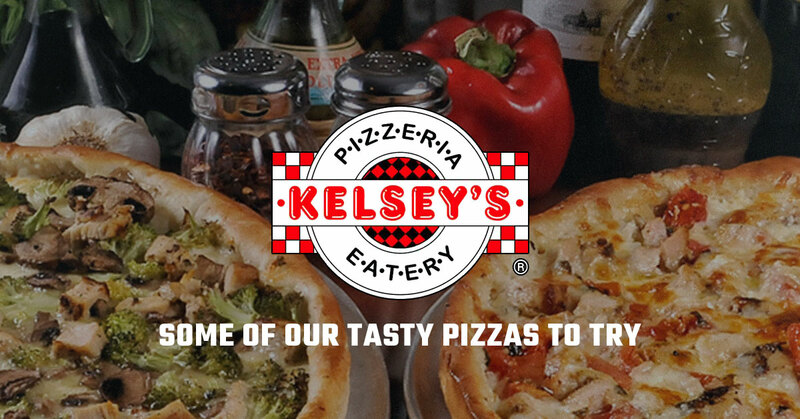 We chose some of the more popular options at Kelsey’s Pizza because we know what you like when it comes to delicious and freshly made pies. We’re proud to tell you that our dough is made fresh daily and on the premises. Our pizza is cooked properly and is not served before it’s time. Fresh and traditional, you won’t beat Kelsey’s Pizza. Do you like a little meat and some vegetables? If you like to have your pizza and eat it too, then the Kelsey’s Special is right up your alley. This pizza has sausage, ground beef, mushrooms, cheese, pepperoni, green peppers, and if you love anchovies, then we’re happy to add those on as well. If you’ve always had a love of chicken Alfredo, then Kelsey’s Milano is perfect for your table of hungry pizza-lovers. Kelsey’s Milano has chicken, mushroom, broccoli, Alfredo, and cheese. What’s great about this pizza option is how it’s almost like a chicken Alfredo dish, but without the noodles. However, even though we’ve substituted the noodles for pizza dough, it’s still just as tasty. If you’re a table of vegetarians, then don’t worry! We have a little something for you and your loved ones to enjoy. This pizza has all the delicious vegetables that you can imagine. Zucchini, fresh mushrooms, tomatoes, cheese, sliced onions, and green peppers can all be found on this vegetarian pizza. Have you ever just wanted everything on your pizza? Well, then Kelsey’s Belly Buster is the right pizza for your meal. With 13 toppings, this pizza is absolutely delicious and very filling. This pizza has salami, cheese, Canadian bacon, jalapenos, black olives, mushrooms, green peppers, onions, ground beef, pepperoni, ham, zucchini, and sausage. The last pizza on our list that you must-try is the Popeye’s Pizza. The Popeye’s Pizza is a pie that’s fit for the great cartoon character. This pizza has spinach, ricotta, onion, feta, cheese, extra virgin olive oil, and to take it up one more notch, some garlic. Is your mouth salivating? Do you have pizza on the mind? Well, then what are you waiting for? Visit this Top Rated Local pizzeria in Titusville to get your full of savory pies.